Finally after all the high winds have died down I walked outside to straighten and fill the bird feeders. 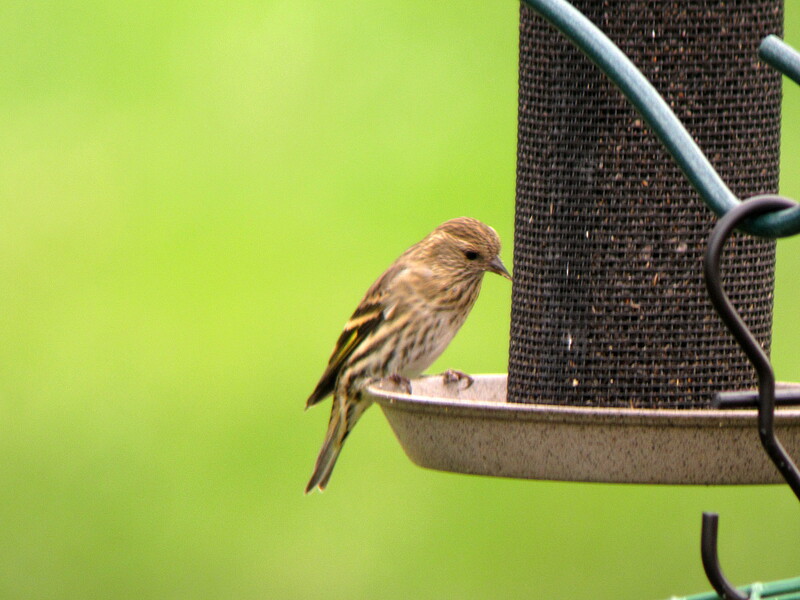 I didn’t want to leave them for any length of time partiality empty in fear that the Pine Siskins would take their business elsewhere. After re-setting the pole and filling up all the feeders I went back inside and waited to see when the birds would return. 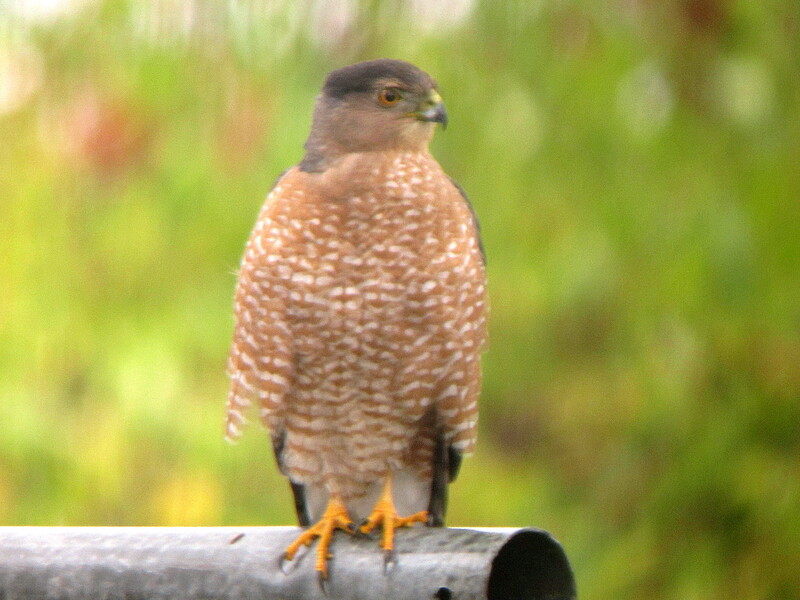 Glancing out the kitchen window towards the backyard I noticed a Cooper’s Hawk land on top of my feeder pole. Running downstairs I wanted to get my camera and try for a picture. The Hawk then flew over to my neighbors yard where it landed on the pole and supports their cloths line. Not wanting to frighten to Cooper’s Hawk, unlike all the song birds, I had to shoot this picture through my back door window, and it might not be the cleanest window. As you can see not all feeder friends need be the cute little song birds we all enjoy. Remember he needs to eat as well. Dedicated to the birder, as we start the week. We all have our favorite birds we enjoy spotting time after time, and I’m no exception. Mine include Cape May Warbler, Scissor-tailed Flycatcher, and Swallow-tailed Kite. 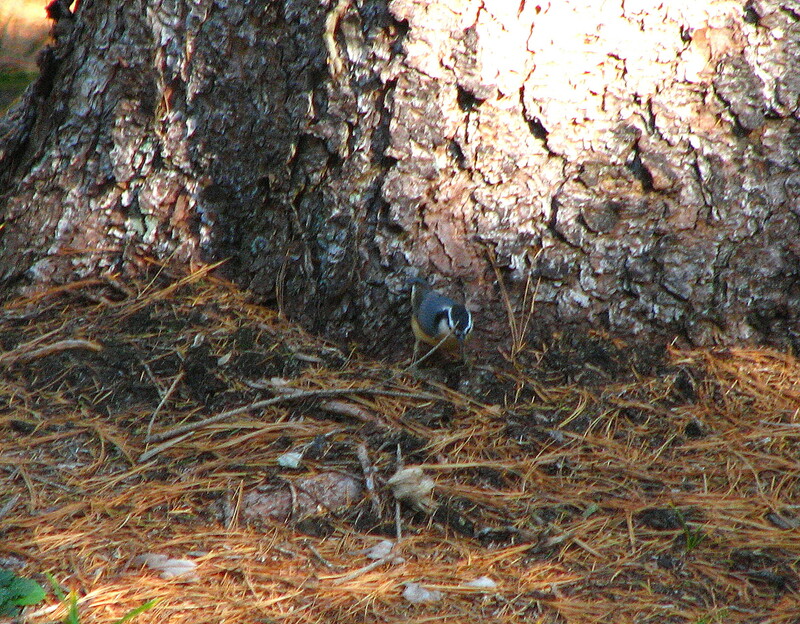 Well I’ve added a new one to this select group, the Red-breasted Nuthatch (Sitta canadensis). This intense bundle of energy was one of my nemesis birds for the longest time, and since then I’ve not gotten over what a great bird this is. 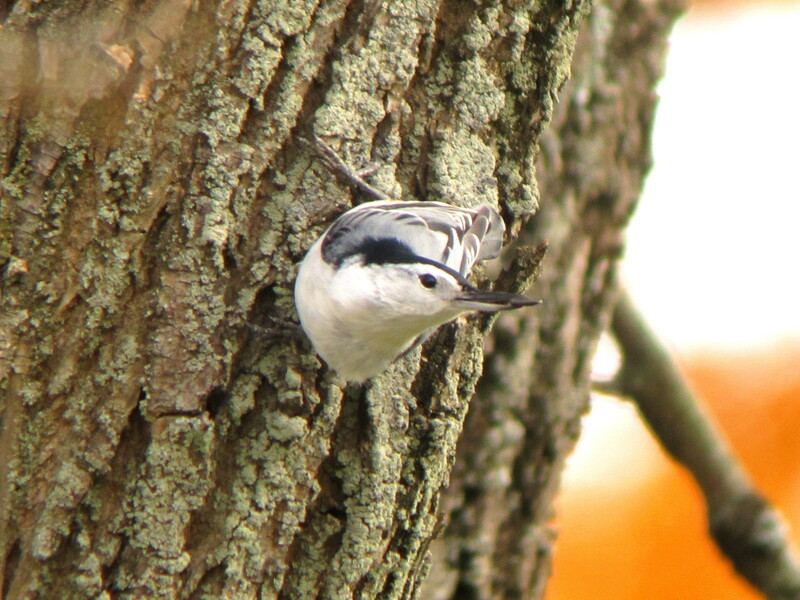 In South-western Ohio the White-breasted Nuthatch is our year round resident, however when Autumn returns to the Ohio Valley that’s when our buddies from the great white north come south for the Winter. The physical differences between a “Red-Nut” and a “White-Nut” are size (4.3″ RBNU/ 5.1-5.5″ WBNU), and coloration is self explanatory. But the one thing I love about them is the “toy-horn” quality of it’s call. It reminds me of the little horn you’d attach to the handlebars of a child’s tricycle. So very distinct for it’s white-breasted cousin. 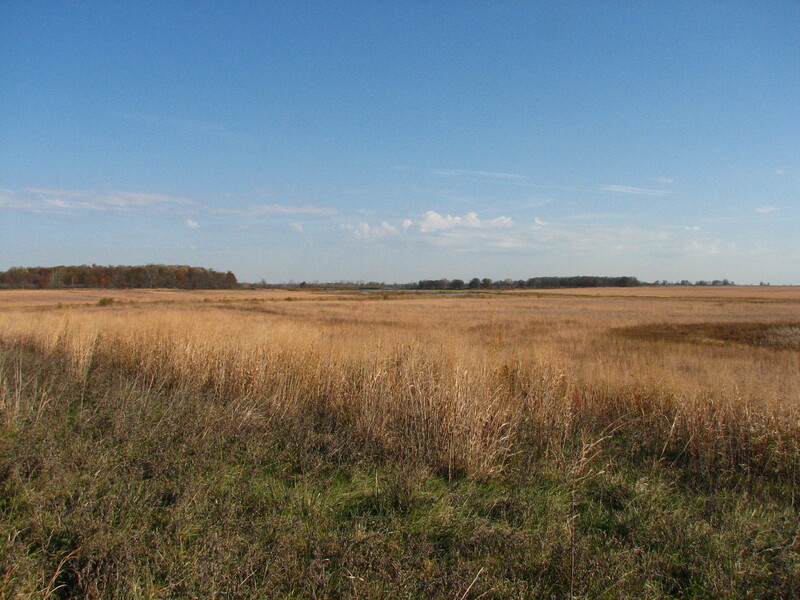 With 2 days in a row free to go birding I wanted to return to the Nature Center at Caesar Creek where Jon and I located all of the RBNU on our last visit. 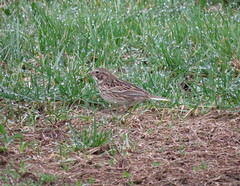 This time my objective was to attempt to get some photographs of these birds. 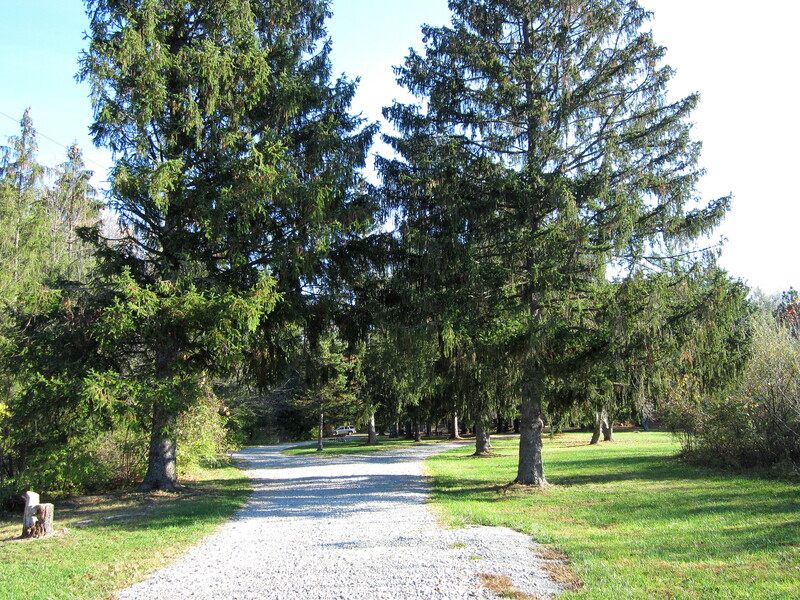 The entrance road to the nature Center and the surrounding land encompasses several acres, and the highlight are all the tall conifers that produce a great canopy for birds like Kinglets, Pine Siskins, and Nuthatches. I arrived about 9:30 in the morning and started to scan the tree tops which are loaded with cones, which attracts all sorts of birds, especially RBNU’s. 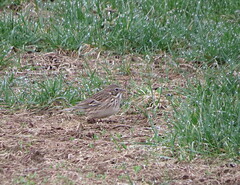 What I was really trying to do was get a digiscoped picture of the “Red-Nuts” knowing that they don’t hold still long enough, so I brought my other camera hoping that it didn’t fail like the previous day when I was trying to get a picture of the LeConte’s Sparrow. 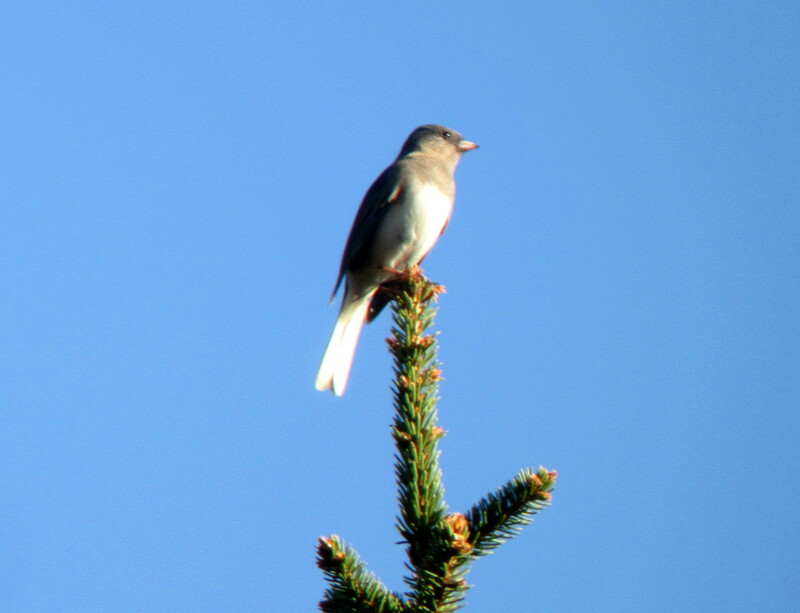 Dark-eyed Junco perched at the very top of this conifer tree. I’m still not getting the quality of picture I think my camera is capable of, but a nice picture none the less. It was about 30 minutes after arrived that I started to here them call. That faint, toy like, call high up in some of the taller trees half way down the drive. I scanned with my spotting scope and there they were, about 6 of them actively feeding from the pine cones. Trying to get a digiscoped picture was next to impossible as they moved from tree to tree, or completely out of sight as they moved around to the far side of the tree away from me. For the next 2 hours I would move from one location to another in a attempt to get any kind of picture. 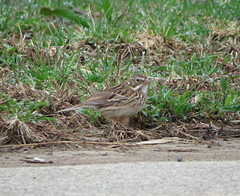 All the while I would continue to bird this area as some very cool birds showed. Spotted a Brown Creeper as it whirled around the trunk of a Evergreen. A distress call from a bird flying overhead showed a Jay sized bird being chased by a Merlin. I was so focused on the Merlin I didn’t even bother to ID the one being chased. Dinner Time. 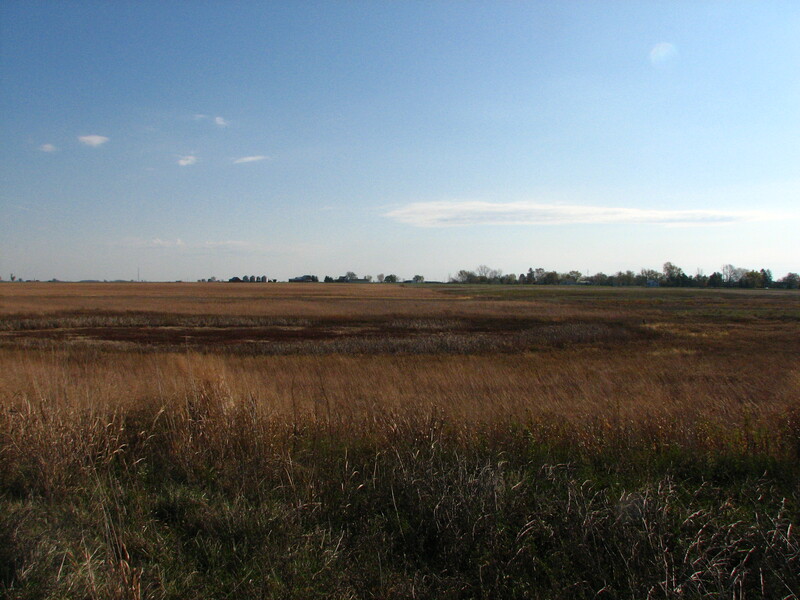 The gravel drive forms a circle as you near the Nature Center, and in the middle of this circle are picnic tables. RBNU were busy feeding close to the ground in this area and not wanting to pass up this photographic opportunity I was able to finally get a decent picture. This one at the base of the tree moved off the tree and onto the ground as it foraged through the the spent pine needles. As it got closer I was finally able to get this shot. You gotta admit this is one cute little bird. As there time here is limited to just a few months try to locate a nice stand of conifers, and more than likely you to will see one of my favorite birds. As the weather starts to cool off and Autumn envelopes us in it’s colorful display of brightly toned leaves, I dig into my garage and clean off my bird feeders. I normally won’t feed birds during the warmer months so they can forage for their own food and not rely on human intervention. This Fall and Winter I’m changing things up a little by placing the majority of my feeders in the back yard, and leaving just one wire mesh seed feeder for the front. My thought for this change up was so I could sit on my deck and digiscope any neat bird that comes to my variety of food I have out for them. Being situated about 70 feet and slightly elevated from the feeders I have a real nice view and I don’t think I’ll disturb them as they feed. 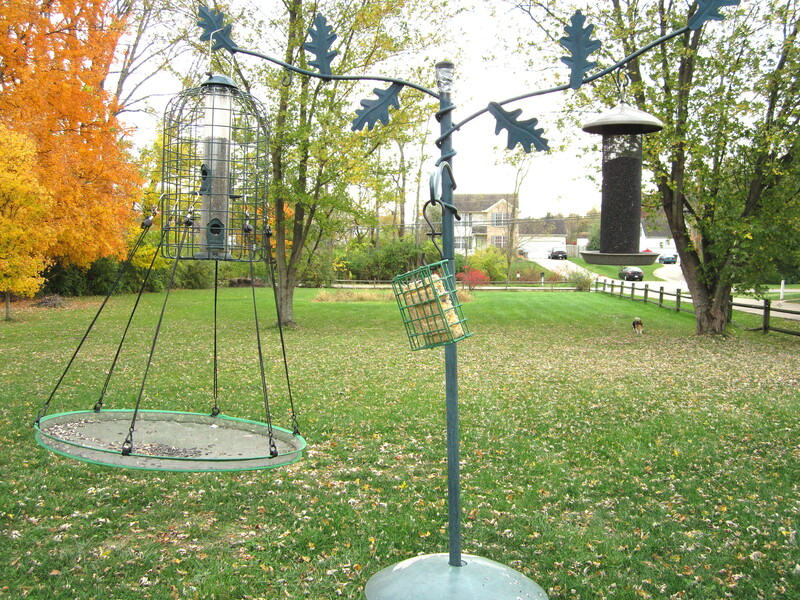 On the left is a tube feeder with Sunflower seeds enclosed in a wire cage so the squirrels won’t get at it. Underneath is a seed catcher so all the seeds that are dropped will be picked up by other birds. In the middle is a suet feeder in a basic cage. And on the right is a thistle feeder. So I was out this afternoon after work sitting on my deck enjoying a Spaten Oktoberfest Bier when I noticed a couple birds on the thistle feeder. 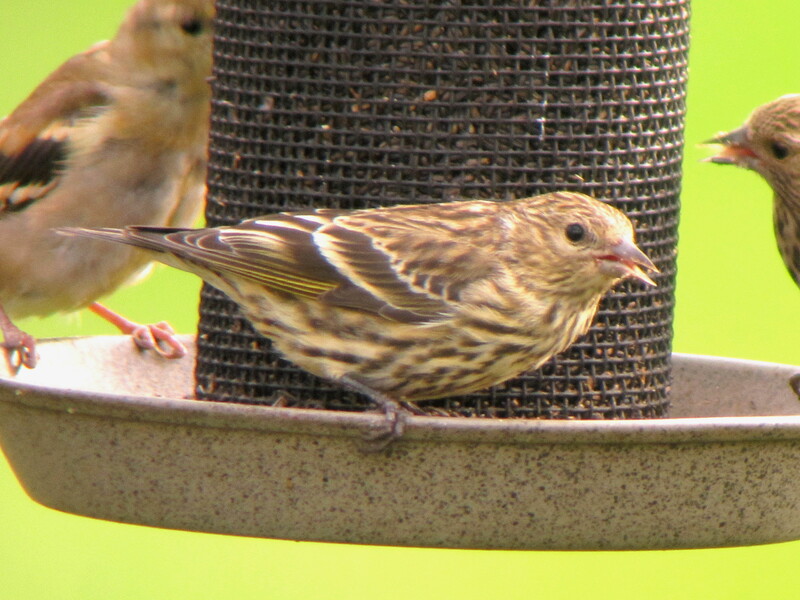 Swinging my spotting scope around and focusing down a little, I was delighted to see a new yard bird, #71, a Pine Siskin. Then more and more started to show up as word spread that the food was pretty good at Houser’s Bar and Grill. 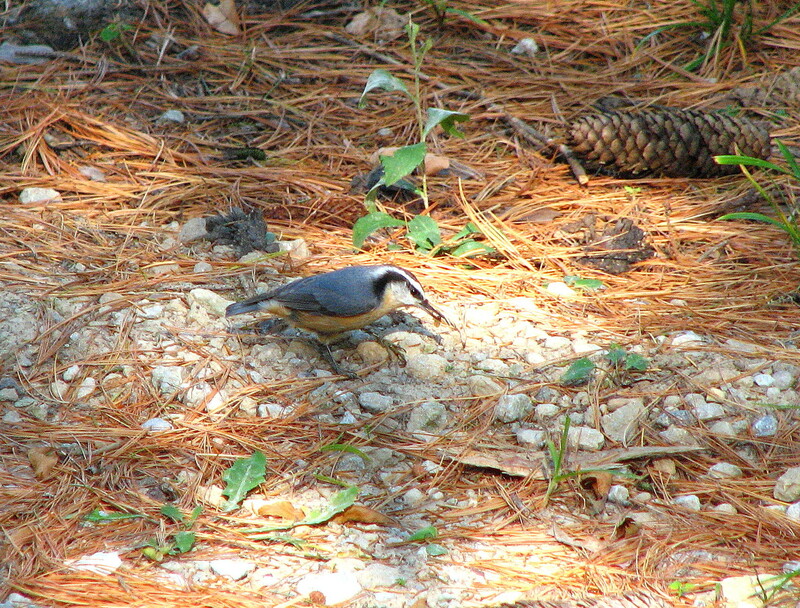 I heard this White-breasted Nuthatch before I saw him. As I was glancing around my tree that was close to my feeding station. I noticed him busy at work. I turned my scope around in the hopes of maybe getting a picture. Well as you can see from the picture he has a Sunflower Seed in it’s beak and he’s getting ready to stash it in the bark of the tree to be eaten at a later date when food becomes slim. As the year wears on and 2013 greets us with cold and blustery weather, I hope to bring you more and more of my new Feeder Friends. One of my loyal readers posted a comment today reminding me about duck hunting season. On September 5th I wrote a post concerning the upcoming “Fall Hunting Season”. 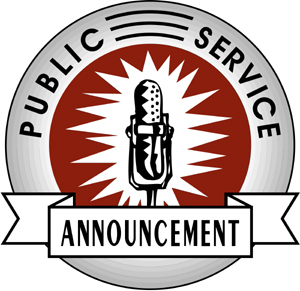 However it’s always worth repeating for anyone who missed the story, that you can link to by clicking on the blue “Fall Hunting Season” above. But just as a reminder that just 2 days ago, on the 20th, duck hunting season opens till the 28th of October for the Southern portion of Ohio. 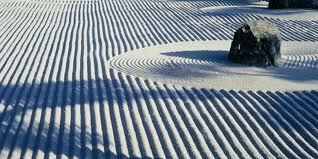 Then it closes till December 8th, and goes till January 27th. 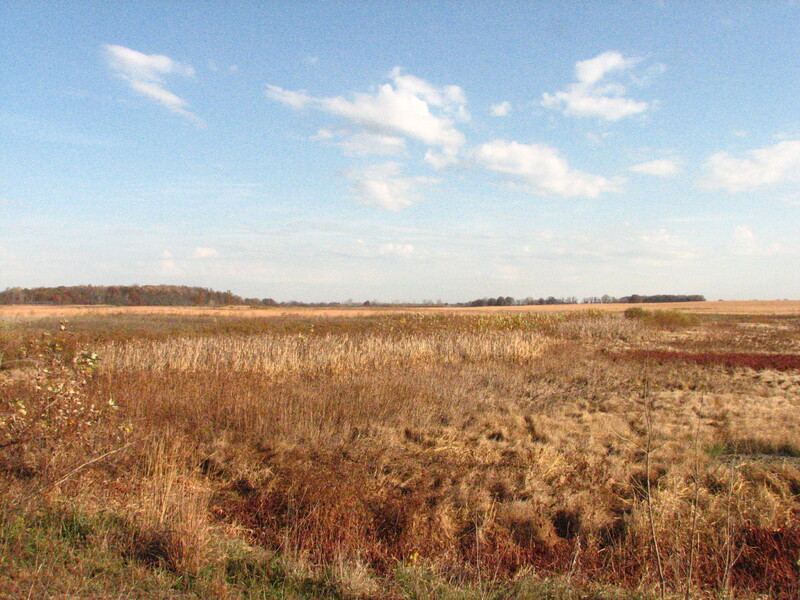 So if you happen to enjoy birding around all of the large lakes that dot the state, show some respect to the hunters who might be sitting in their blind. You might not be a hunter or hate the idea of hunting birds altogether, but they have every right to be there as we do and there season is short in comparison to the fact that we can go birding 365 days a year. So let’s give them some space.